These pilots passed my training with "flying colors". 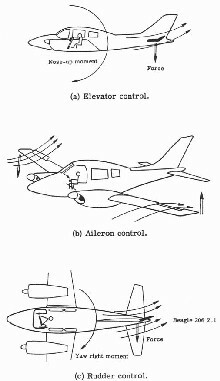 Simple illustration of the main control surfaces of an aircraft. A very novice and easily countered move, nonetheless essential to a pilot's bag of tricks. This is basically an attempt to out-turn the target. As you move to intercept, you begin an early turn into the flight path of the target. Lower your throttle to maintain a tighter turn. Using your views, make sure the target is in the 45 degree up forward view. Open the throttle fully and maintain the turn. When executed properly, you will find yourself on the target's six with little opportunity for evading your fire. Do not turn too soon into the target's flight path. A wary foe will throttle down and apply flaps to counter the move before it even begins. Don't attempt the Lead Turn if your target plane has a superior turning ability. The exception would be if the target is traveling at too high a velocity to maintain a tight turn. Do not try to force the turn by yanking the stick to it's further back position. You will simply stall, lose the turning race, and find yourself at a disadvantageous air speed.